Philips is going hard for the mid-range LCD market with the 7303 series. It features the same Ambilight technology that's impressed us in previous years, but pairs this with a direct lit VA panel that looks set to offer great HDR performance - even if we're still a little concerned at the low peak brightness of the set. Philips has unveiled its European TV line up for 2018, and it’s fair to say there are some seriously eye-catching sets in there. The high-end is covered by no less than three different OLED TV series; the relatively low end is dominated by the very promising Philips 6703 series previewed separately; while standing out from the middle of the brand’s 2018 range is the 7303 LCD TV range. When we say ‘standing out’, we mean it. You’ll struggle to find a more glamorous looking mid-range 4K HDR TV option this year. For starters, there’s the gleaming silver brushed metal finish applied to its screen frame. Then there’s the lovely glass and metal desktop stand. Most eye-catching of all, though, is the 7303 series’ Ambilight technology, which casts coloured light from three of the TV’s four sides. This light can even be set to track - with startling local and tonal accuracy - the colour content of the pictures you’re watching. As well as being a great talking point at parties, the 7303 series’ Ambilight system makes long-term viewing more relaxing and immersive because the brightness of the TV's screen won't contrast so aggressively with the darkness of the room around it. The TV's desktop stand is quite wide, potentially making it a challenge for narrow bits of furniture. It is at least centrally mounted, though, so it’s more likely to fit on furniture than sets such as the new Philips 6703 that use legs placed towards their bottom corners. The 7303 will be available in 43-, 50-, 55- and 65-inch models when it launches later in the first half of 2018. The 7303s’ picture features should catch the eye of AV fans too. Particularly their use of a direct LED lighting system, where the LEDs sit directly behind the screen rather than around its edges. This approach generally delivers more evenly lit dark scenes - especially on large screens. Also noteworthy for AV fans is the use by most (though apparently not quite all) 7303 models of VA rather than IPS panels. Experience shows that VA LCD panels deliver much better contrast than IPS ones, so it’s great to see Philips moving that way for 2018 having focused on IPS with the equivalent range last year. Note that the 7303s are joined in Philips 2018 TV range by 7803s, which use edge LED lighting and IPS panels. These also benefit from more brightness and ‘Nano Colour’ technology that helps them deliver a wider colour range. If you're a fan of HDR however, the 7303’s direct lighting and VA panels are hard to resist. At least if you’re the sort of person who likes to watch films in dark rooms. If you’re looking for reasons beyond mere design differences to step up from the 6703 series to the 7303s, the latter ranges boasts three further key step-up features. Starting with their P5 picture engine. The P5 system is the most powerful and efficient picture processing system Philips has ever developed, and is designed to focus on the key five pillars of picture quality: Source identification/enhancement, sharpness, colour, motion and contrast. It delivered superlative results when it made its debut in Philips’ 55POS9002 OLED TV, so it’s exciting to find it now filtering down to TVs likely to be as affordable as the 7303s. The 7303s also scores over the 6703 series by including the Android TV smart platform. This delivers hundreds of apps in a sophisticated (if sometimes cluttered) interface, as well as enhanced connectivity with Android smart devices. This enhanced connectivity includes the ability to use your Android phone to streamline the TV’s initial installation, and built-in Google Assistant support that includes being able to control connected Google Assistant-capable devices. One last big difference in the 7303s’ picture specification versus the 6703s is its motion handling. Courtesy of the P5 engine, this is almost 50 percent more powerful on the 7303, potentially doing a significantly better job of reducing judder and blur from action scenes without generating distracting, unwanted processing side effects. It’s a bit disappointing, perhaps, that the 7303 series doesn’t improve on the mere 350 nits of brightness claimed by the 6703 series, as this will presumably reduce its impact with the HDR10 and HLG high dynamic range formats it can support. However, experience suggests Philips’ P5 processing will be able to get more impact from the brightness available to the 7303s than similarly rated rivals. 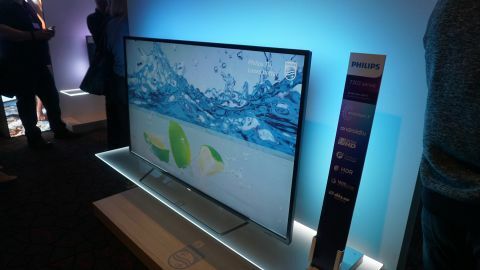 The new Philips 7303 range is due to launch in the spring. Although Philips can’t yet share details of pricing, we’ve seen enough already to know that these sets have the potential to bring some real quality to the mid-range LCD marketplace. Look out for a review as soon as we can get our hands on one.